For vehicle operators and office environments, CVG Seating (India) Pvt. Ltd. is at the leading edge of technological design and development. We aim to provide a solution with seating which will help prevent back and other related pain arising from being seated. Products are tested not only in the CVG Seating (India) Pvt. 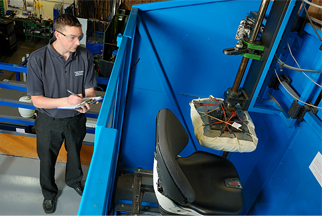 Ltd. test department but also by other national bodies to ensure that the seating complies with current legislation. We strive to create safe working environments in our factory and office for CVG employees and visitors. This is rigorously checked on a regular basis.